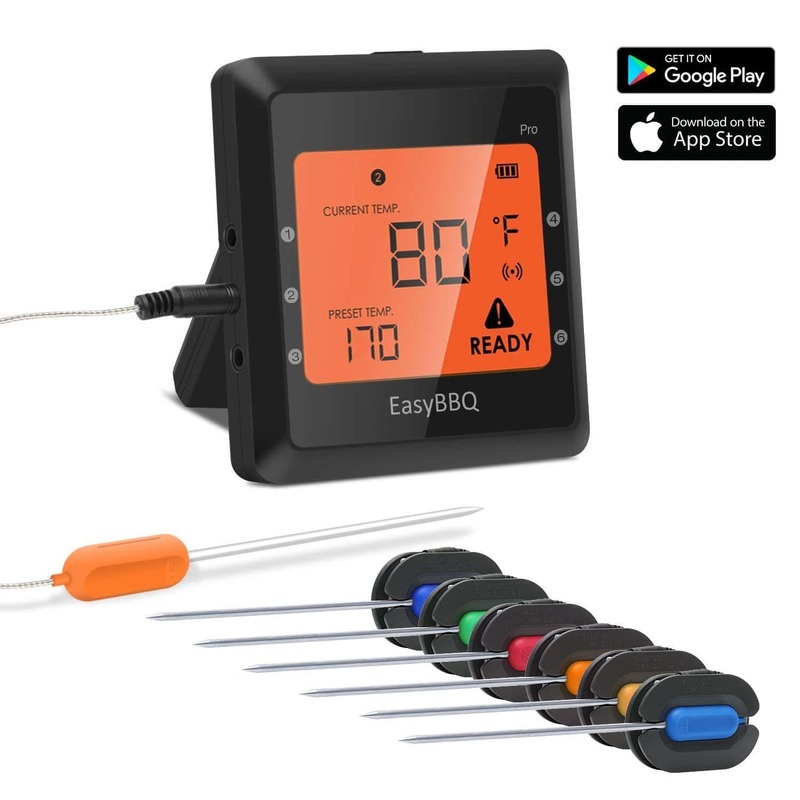 This updated Top 10 Best Digital Meat Thermometers Ratings Guide for 2018 includes five new first time entries to this list that I am excited to share with you. Can any of these new entries replace last year’s choice for best wireless probe thermometer? You will have to read on to find out. By now, everyone should know that food thermometers are the only way to guarantee that your meat is safely cooked. You can forget the timers, and you should definitely forget the widely touted but oh so unreliable poke test! Temperature is unwavering and needs to be accurate when it comes to food safety. Is it really worth taking the chance of getting your loved ones sick? I would even make the argument that food thermometers are just as important as the utensils we use to eat with. If you have friends who think using a thermometer is cheating, then they obviously don’t consider safely cooked, juicy, tender and mouthwatering meat to be a good thing. If they really understood that the right temperature of your cooker and the internal temperature of your food is what creates those awesome results, I bet they would change their tune in a hurry. 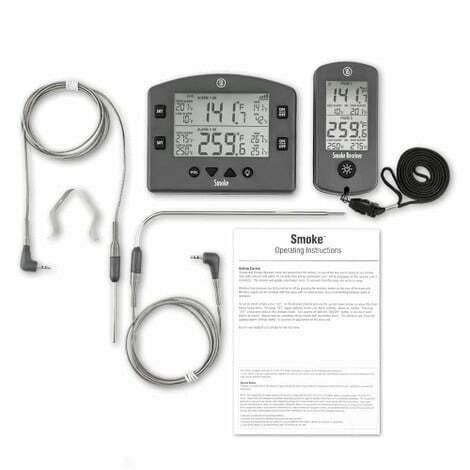 I put together this top 10 digital wireless probe thermometer rating guide to help you choose the best wireless grilling thermometer to fit your budget and needs. *Note: I included a quick list of my Top 10 Best Digital Meat Thermometers below. Read on for more info on each, including pictures, along with my ranking system, a buying guide, and user tips. I also included a few bonus and worthy wireless thermometers that barely missed the cut. Digital wireless meat thermometers are an innovation that shouldn’t be overlooked. They give you the opportunity to monitor your meat to the degree and pull your food when it is at the perfect temperature for you while still meeting food safety guidelines. You can also follow the temperature of your grill, smoker, or other cooking appliances. They are a terrific addition to any griller or outdoor smoker’s toolbox. But Choosing the perfect digital remote meat thermometer to use can be tough. What should you look for in a good thermometer? How much should you spend on the best products? I’ll try to answer those questions, and a few others, in the information below. With such a big number of products to choose from, it can become confusing trying to decide which one best fits your needs. It all comes down to being informed on the different choices to help you decide which is best for you. That’s where I come in. There is a broad range in prices depending on features and brands. Using this guide, you will surely find exactly what you are looking for in a wireless probe thermometer. This product overview acts as a buyer’s guide to ten of the best wireless probe thermometers on the market today. I’ll show you what features to look for, and give you many options of digital wireless probe thermometers and price ranges along the way. 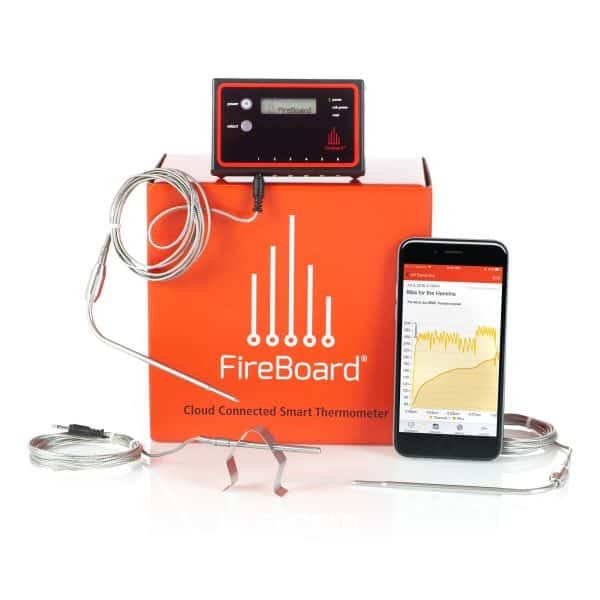 Why Are Digital Wireless Probe Thermometers Needed? Owning a good wireless probe thermometer will take the guesswork out of cooking when it comes to both your food and your grill’s temperatures. And that is the key to awesome results. They give you the peace of mind of knowing the timing during every step of the preparation and cooking process for each piece of meat you cook. They are also a great way to boost your confidence to extend your grilling and smoking repertoire to the next level. But if that’s not enough to convince you, then consider the safety aspects of using a food thermometer. You will never have to second guess yourself when you use a wireless food thermometer. Keeping food out of the danger zone and cooked to the proper temps to avoid the spread of foodborne bacteria is one less thing you will have to worry about. 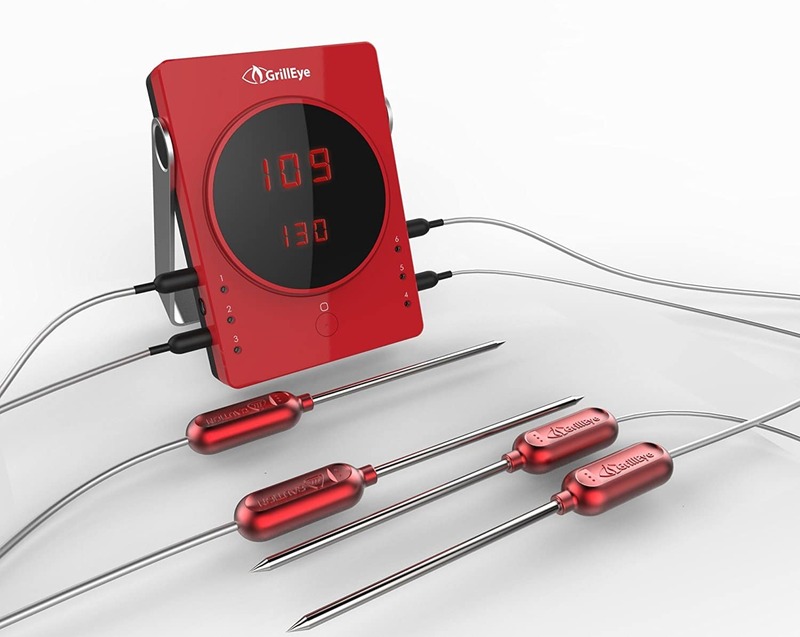 What matters most in a good wireless remote meat thermometer is accuracy, wireless range, and ease of use. 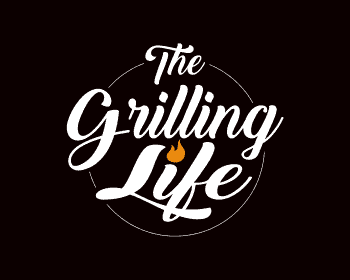 The first questions to ask are how easily can I set this thermometer up and quickly be able to see an accurate temperature reading of my food and grill. A thermometer that is confusing, difficult to configure, has inaccurate probes and comes with limited wireless range can make a huge difference in the outcome of your cook. I took into account the accuracy of each wireless thermometer. 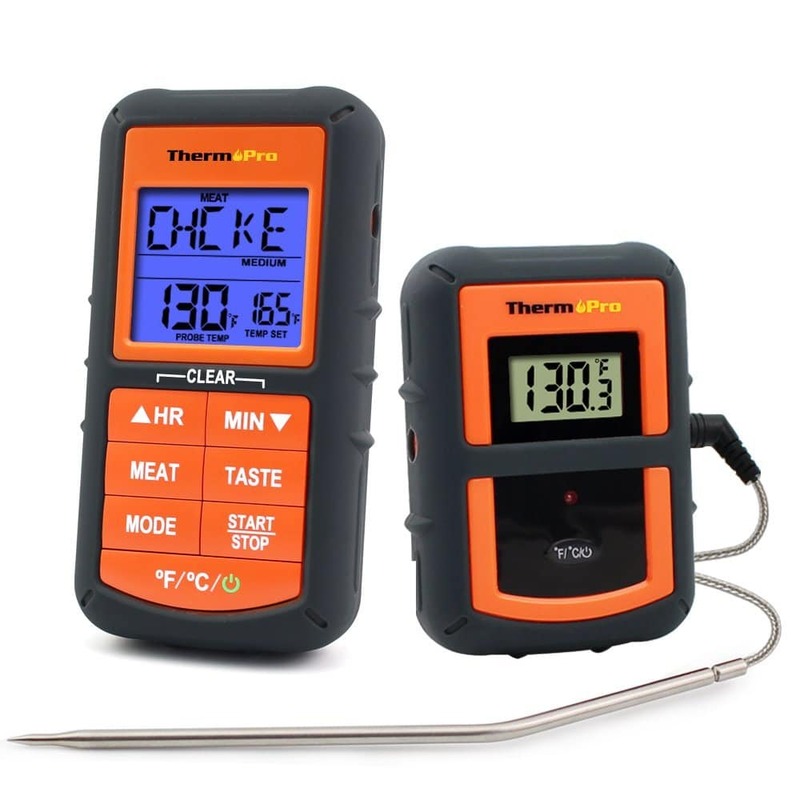 How precise are the readouts for both the meat probe and the air probe compared to my Thermoworks Thermapen instant read thermometer? The closer they match, the better. Any wireless probe thermometer with a temperature range between -58.0 to 572.0°F or better is considered very good. Any with a range between -4°F to 480°F is considered good. Any with a range between 32 ºF to 392 ºF is considered ok to bad. Any wireless thermometer with a wireless range of 300 ft or better is considered very good. Any with a range of 150 to 250 ft is considered good. Anything lower is considered lacking. I also took into account the reliability of the connection and the speed of temperature updates to the wireless receiver. I took into account the quality and durability of the unit as well as battery life for each thermometer reviewed. 3,000 – 5,000-hour battery life is considered very good. 1,000 – 2,999 is considered good. 999 and below is considered ok to bad. Is the thermometer easy to understand and program and are the controls easily accessible and user-friendly? Does the thermometer come with any extra features like backlighting readouts, mobile apps, auto shut-off features and do they come with and support multiple probes? This is just to name a few. While extra features are by no means a deal killer if the thermometer being considered is a quality product, I consider them “nice to haves” and factor them into my ultimate decision. I took into consideration price when comprising this list so I could provide a wide range of options ranging from top of the line models to low cost but highly rated and functional models. Is the value you receive worth the money? Finally but just as importantly, I took into account verified purchasers reviews and feedback. I scoured every manufacturer and Amazon seller pages for feedback and comments on 30 plus remote digital thermometers to narrow down this list of the best of the best. I don’t believe any review is complete without taking into serious consideration regarding actual long-term users and their experiences with using a product. I broke down ten of the best digital meat thermometers using the characteristics mentioned above. These thermometers come in a range of prices and come with a variety of features. Let’s check them out! It’s impossible to say too many positive things about the ThermoWorks Smoke Wireless Thermometer. 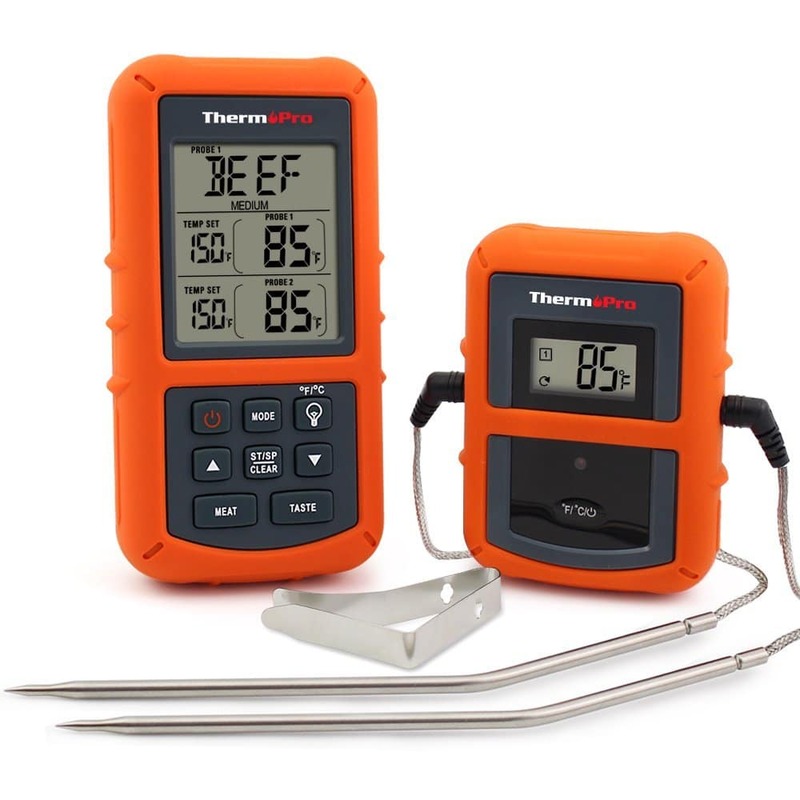 Although ThermoWorks maintains that their thermometer is designed for pro barbecue teams cooking in competitions, pit masters, and professional cooks, the truth is that anyone who grills, bakes, or roasts will want to get their hands on it. The unit boasts two channels—one for cooking meat and one for use in the smoke pit. The design involves a sealing process that makes the IP65-rated thermometer splash-proof. The display, styled like an easy-to-read dashboard, features the minimum/maximum temperature and high/low alarms, so there’s nothing complicated about it, and the backlighting allows you to see the readout even low light conditions during late night cooks. The thermometer arrives already paired up with the receiver, so even fresh out of the box, it doesn’t require any setup. The receiver is capable of a wireless connection that holds strong as far as 300 feet away from the unit, meaning that you can head to the front yard or return to the kitchen while the meat cooks outside, and you can keep an eye on the temperature the entire time. 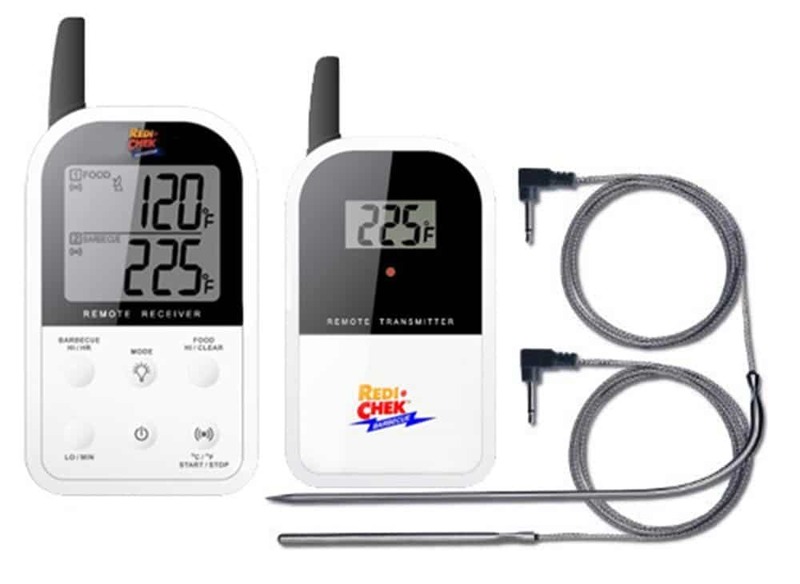 Although the thermometer only has two channels, you can pair it with more than one wireless receiver, so that everyone cooking has their own receiver. The ThermoWorks Smoke has a large temperature range of -58ºF up to 572ºF giving this thermometer a wide range of uses. With a reliable wireless connection of up to 300 feet, you won’t have to worry about spotty or lost signals. The Smoke costs $99 on the ThermoWorks website, but I often see sales that will bring the price down a bit. Even with the higher price of the Smoke, it’s still one of the best buys for your money. It gets way more right than it gets wrong, and you can’t beat the ThermoWorks reputation. The Maverick ET-732 is an older generation of the Maverick ET-733, but it can’t be left out of our list. At about 20% cheaper than the ET-733, the 732 is a great budget probe if you want most of the features of its older brother at a discounted rate. The ET-732 uses a wireless receiver and comes with two probes. One of the probes is specifically for the grill grate. Don’t let the fact that there is an upgraded model (RT-733) deter you. This is still a great wireless thermometer. The reason I have it ranked above the 733 version is that not everyone needs all the extra bells and whistles that come with the upgraded version. The 732 is still one of the most accurate and well made wireless thermometers on the market that will suffice for most user’s needs and at a lower price. The ET-732 has a temperature range of 32 ºF up to 572ºF. A good smoker specific thermometer doesn’t need to go below 32 F anyway, right? The wireless range is at the top of the industry standard for wireless receivers. The Maverick ET-732 ranges to 300 feet and is quite reliable. Ease of use is a big selling point for this thermometer. The transmitter and receiver come pre-paired right out the box. Just plug it in and attach the probes and you’re ready to rock! The receiver also comes with a backlight making evening grilling easy. The Maverick ET-732 is built with high-quality materials and the function is easy to use. Maverick is well respected and one of the top contributors to thermometer arena. It sells for about $59 on Amazon. At its heart, grilling is about simplicity and details. Cooking on the stovetop or in the oven can get complicated due to the various techniques you can employ in a traditional kitchen, to say nothing of the herbs and spices you use to flavor your food. It’s not that you don’t use marinades and spice rubs with the meat you grill or smoke, but that it’s not nearly as necessary. You want to throw the meat on the grill and enjoy the taste of it. I say all that to say this: the ThermoWorks DOT is a small, simple thermometer that does just what it’s supposed to do. It only has two buttons, and those two buttons are all you need. Using the up and down buttons, you can set the temperature target you want to end up with when your food’s done. Stick the probe in your meat. Once the probe senses the finished temperature, the DOT beeps, and it keeps beeping until you press a button. The display flashes to alert you, as well, but it stops as soon as the temperature dips below the target. One of the benefits that speak for the DOT the loudest is its versatility. Where many other thermometers are strongly recommended just for use on the grill or in the smoker, the DOT is a wonder in the kitchen, as well. Use it for baking breads or pastries, candy making, roasting, brewing beer, and Sous Vide, which is currently having a moment. Adding to its convenience, there’s a switch on the back that toggles between Celsius and Fahrenheit, magnets to stick the thermometer to your fridge or grill, and a tilted stand to prop it on the counter. The ThermoWorks DOT has a temperature range of -58ºF up to 572ºF making this a thermometer of many uses. Both the current temperature and the preset temperature are displayed in big digits that can be seen from a distance. The Dot runs around $39 on the ThermoWorks website. The DOT does exactly what it was designed for, and more. It’s a handy little thermometer that doesn’t take up a lot of space and fulfills a variety of cooking tasks. Finally, the quality and customer service that comes with a ThermoWorks product can’t be beaten. 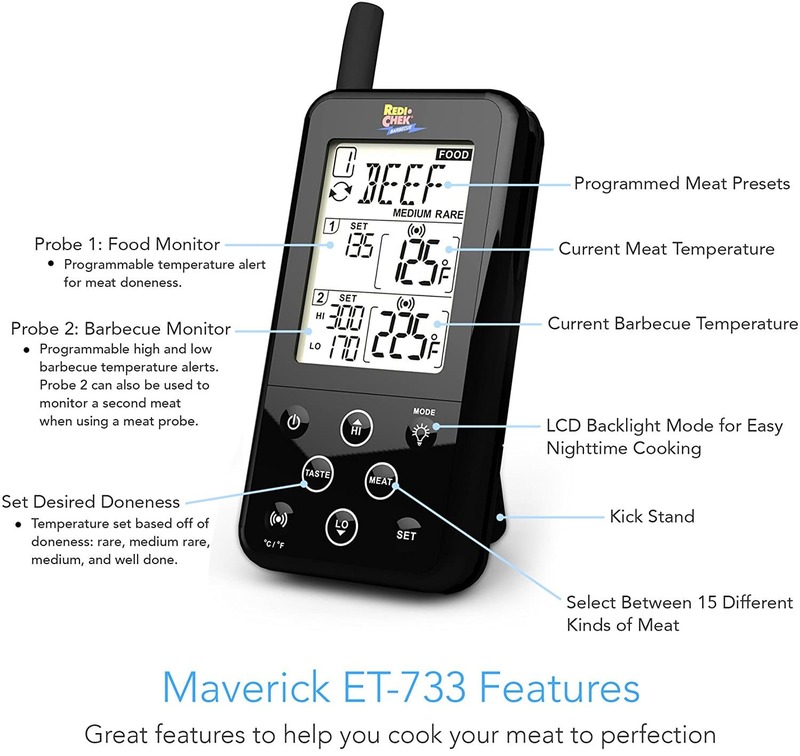 The Maverick ET-733 is a nice improvement from Maverick’s last generation of the thermometer, the ET-732 (Reviewed above). The ET-733 is set up to withstand the smoke and moisture from a smoker and has features to follow both the meat and the grill’s temperature. 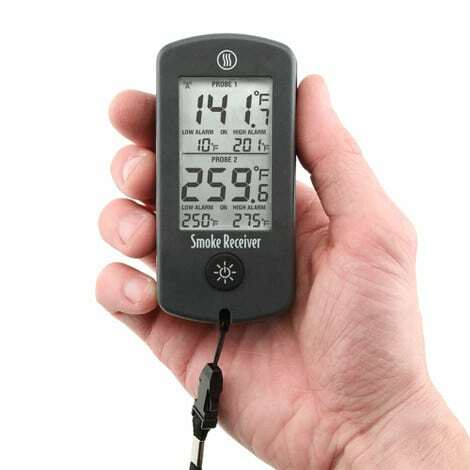 This allows you to observe the temperature you are cooking at, and keep that peak temperature throughout the smoking process. The main upgrades from the ET-732 include a larger, backlit screen that displays even more information. You can now see the custom set alert temperature at all times on the display. The controls have been updated to be more intuitive and the presets have been increased to fifteen types of meat to choose from. 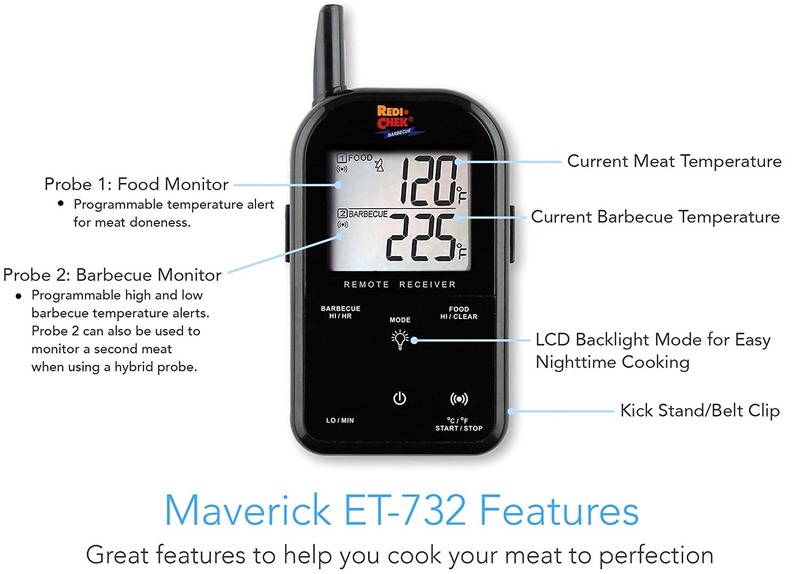 The ET-733 has a temperature range from 32 ºF up to 572ºF, making the Maverick ET-733 a good meat specific thermometer. Its range won’t go below freezing, so maybe look further for a good all-purpose thermometer if you intend to use it for that purpose as well. The Maverick ET-733 comes with a wireless remote, which works from 300 feet away. The remote’s screen is backlit with LCD and beeps and changes colors to alarm you if your meat goes above the preprogrammed temperature. The Maverick is priced at $69 on Amazon and can be had in multiple colors. 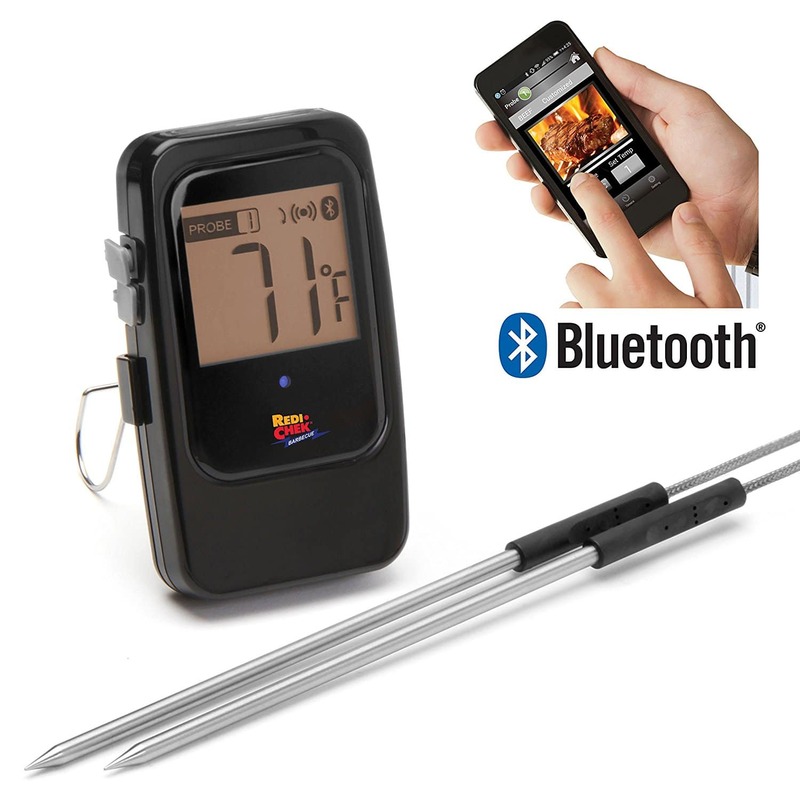 The ET-33 is well-built, easy to use wireless grilling thermometer. It has some unique and helpful features, and for the price is a good mid-range thermometer. Maverick has a great reputation as well. Thermopro is another top name in the wireless thermometer arena. Thermopro wireless thermometers range in power, size, and features. The ThermoPro TP20 comes with two probes and a 300-foot range wireless receiver. The unit comes paired out of the box so you can say goodbye to the annoying pairing set up step. The large backlit LCD displays both the food and grills temperature including your preset temps. It comes with two food-grade stainless steel probes with step-down tips designed to be faster and more accurate. The probe wires can withstand temperatures up to 716°F. The orange body of the unit is a good look too. 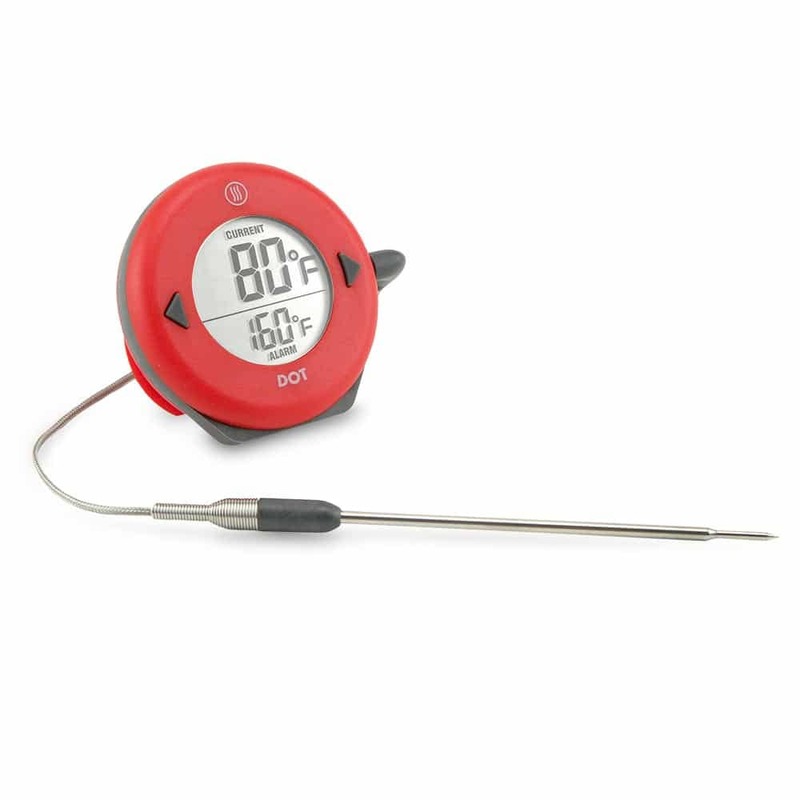 The TP20 has a temperature range from 32 ºF to 572ºF, making it a go-to meat specific wireless thermometer. The wireless range for this ThermoPro extends to 300 feet, to keep you cooking up a storm across dishes and distances. With temperature reading accuracy of ±1.8˚F, you can rest assured your food will come out perfect. The TP20 is super easy to use and user intuitive. The nine preset meat temperature ranges allow even the newest of grillers to get started right away. An orange rubber sleeve case comes included adding another layer of protection and sharp look. You also get great customer service to go along with the well-regarded ThermoPro line up. This is a high-end thermometer with a nice wireless range. It costs less than $60 on Amazon. The fact the ThermoPro is willing to replace any probe, free of charge if it starts to falter on its temperature accuracy is worth the price alone if you ask me. 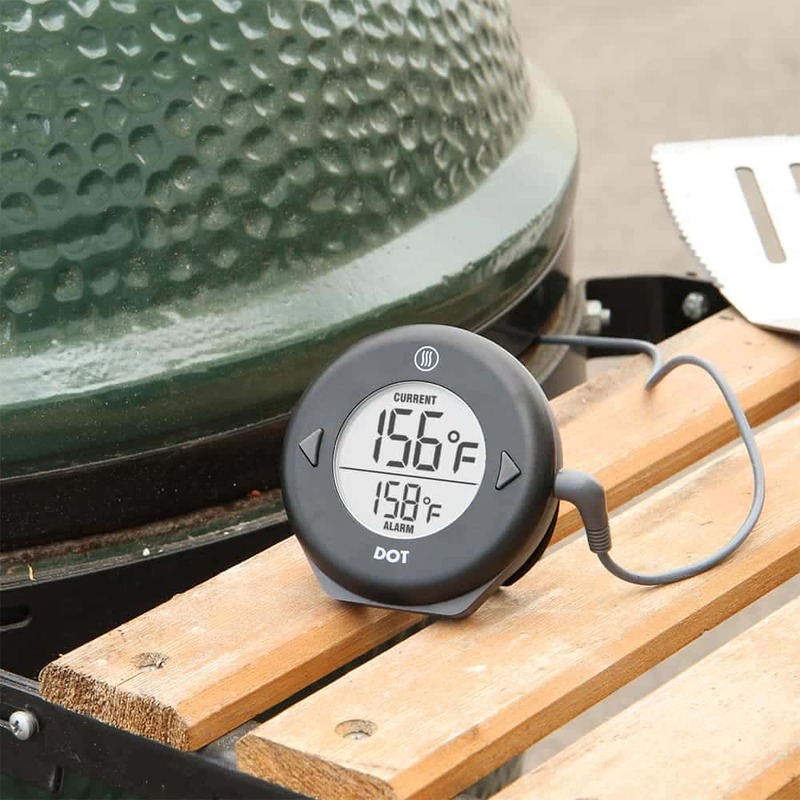 INKBIRD’s Bluetooth Thermometer is a must-have for tech-loving grill enthusiasts. It might just be the coolest thermometer on the market in terms of what it can do—and what you can do with it. The Bluetooth syncs with your smartphone when you download the app, which lets you do everything, essentially. All you have to do manually is to insert the probe, honestly. You can check the temperature from up to 150 feet away with a reliable connection. You can also check the battery level via the app. That’s convenient because the unit is rechargeable. It comes with a cord so that you can juice up its 1000mAH lithium battery when needed. Obviously, the easy to understand app reveals everything you need to know, plus you can access a temperature graph. However, the unit itself has a large and clear LED display, as well. You don’t have to pull out your phone if you want to monitor your meat old school style. It will function just as well as a standalone unit. Another convenience is the ability to rotate the display. 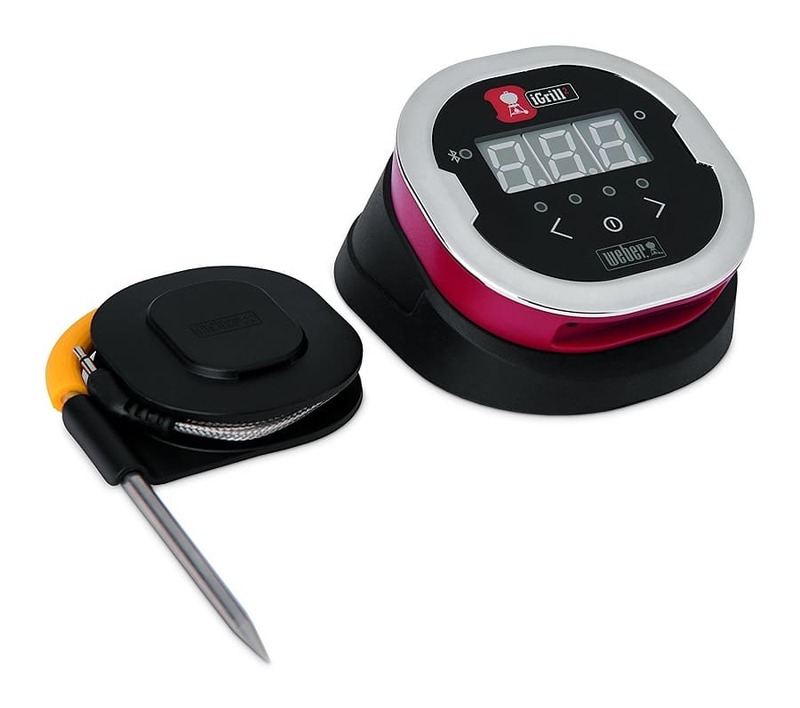 Since the thermometer unit has a magnetic design, you can stick it to the grill, smoker, pot, or oven. If you find that the display is upside down, the tap of a button flips it for you. That’s a small detail, but neat and completely useful. Fully charged, the battery should last about 60 hours, which is more than ideal for a long, low, slow smoke. The IBT–4XS offers a nice temperature range of 32℉~572℉. The INKBIRD IBT-4XS comes in at a price of $59.99 with four probes and $49.99 with two probes. You can always purchase additional probes later if you find you want them. The cool factor, the accuracy, and the warranty make the INKBIRD Bluetooth Thermometer worth the buy. Its disadvantages are inconvenient, but they aren’t deal breakers. 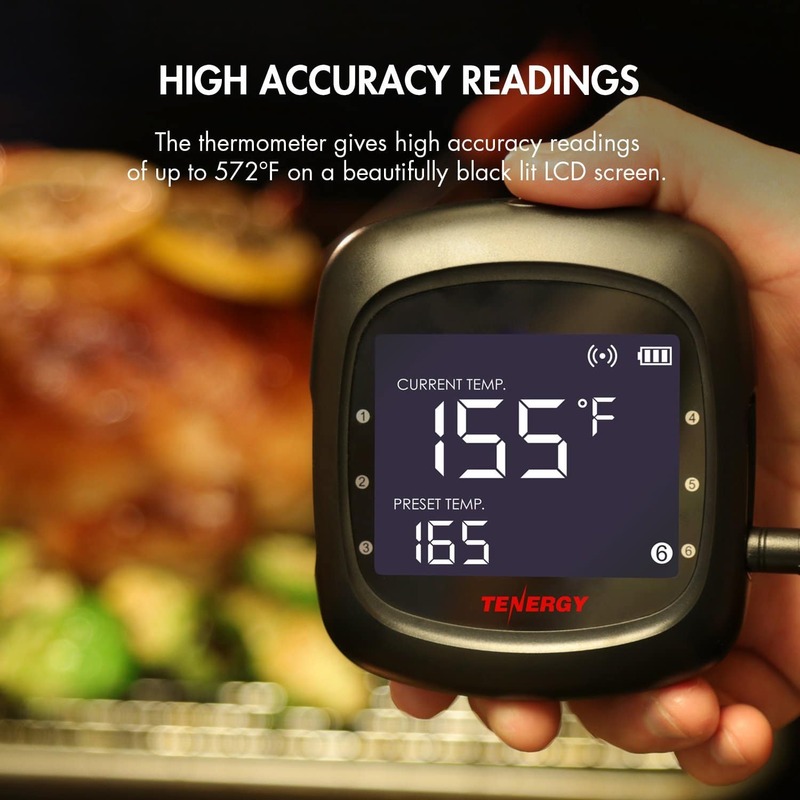 As an app-driven unit, the Tenergy Solis Digital Meat Thermometer may be an even better bet than the INKBIRD. The app doesn’t even make you open it up to check on temperature or other settings; you get real-time updates on your smartphone. All you have to do is enable push notifications. It also beats out its competitors with its precision. Regardless of the temperature at which you’re cooking, the manufacturer claims it is accurate to within ±1℉. Whereas most other thermometers only guarantee accuracy to within ±1.8℉ or more. Since it’s probes tips are safe in heat as high as 716℉, you don’t have to worry about the temperature getting sloppy as the heat climbs. The probes can measure heat between 32 to 572ºF. Open up the app and be amazed. There are 11 presets for every imaginable protein. Each setting hits on the perfect temperature for a particular protein, such as beef, chicken, fish, turkey, hamburger, veal, pork, and lamb. 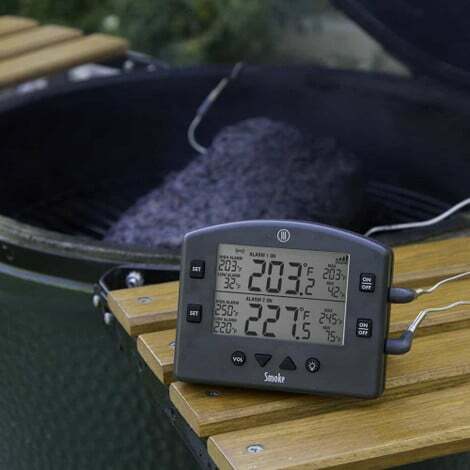 There are also presets for monitoring your grill like BBQ smoking, cold smoking, and hot smoking. Of course, if you want your food at a different temperature than the preset, that’s no problem. You just input customized settings that suit your preferences. The list of appropriate temperatures is helpful for novice cooks and new grill masters, though. It takes all of the guesswork out of the cooking process. You won’t ever overcook your steaks again, at the very least. The Tenergy Solis costs $65.99 on Amazon. 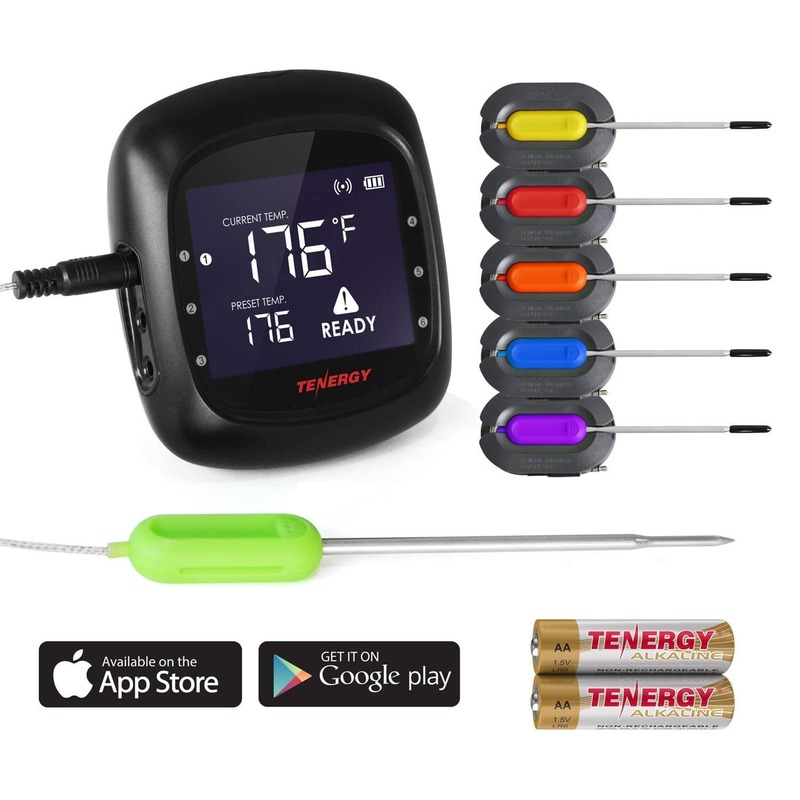 The app alone makes the Tenergy Solis thermometer a smart choice. The precision is impressive, as well. Again, there’s no way the cons are deal breakers. Silipower’s Wireless Digital Thermometer also runs via an app—this is the future of cooking, folks—and in spite of the product name, there’s nothing “silly” about it. Sync it to a smartphone or a tablet. The ability to use a tablet is a notable option because it’s easier to follow recipes on a larger screen. There are presets on the app that gives you the ideal temperature for the most popular proteins, such as beef, poultry, and fish. If you prefer a different temperature, then you can change the presets to any number you like. Like many of its competitors, it can handle temperatures as high as 572℉. It also has openings for up to 6 probes, meaning that you can monitor as many as six different pieces of meat, pots, pans, or baking dishes at once. Don’t worry about it getting one food mixed up with another—it’s a smart thermometer, after all. The probes are color-coded, which cuts down on any confusion for the chef, too. Each probe is composed of 4 inches of stainless steel that meets food grade specifications. It’s long enough that you don’t run the risk of burning yourself. The mesh cable is reinforced with stainless steel and measures 48 inches. The length guarantees that you won’t splash your thermometer with sauces or hot oils. The Silipower costs $67.99 on Amazon. 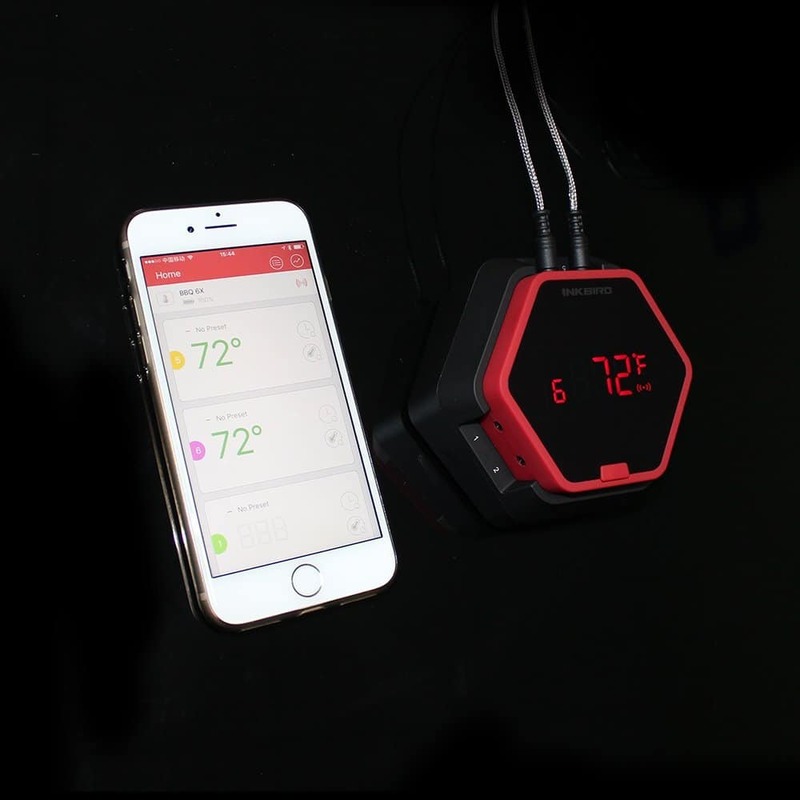 The interface of the app and the multiple probes are standout features of the Silipower Wireless Digital Thermometer. That being said, there are similar thermometers that do the same for slightly less. 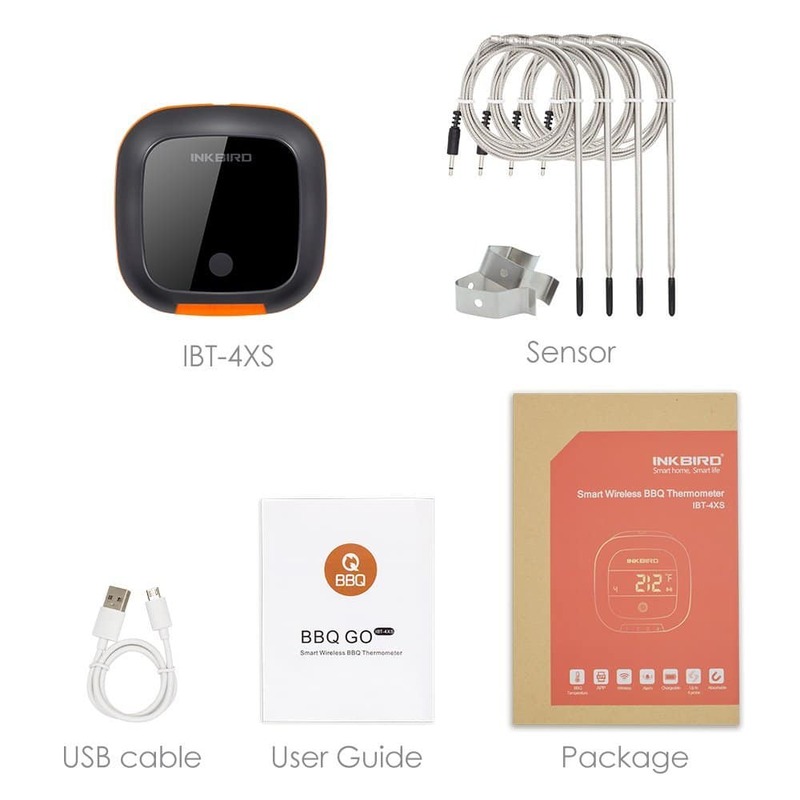 The Weber iGrill2 comes with quad probe abilities and Bluetooth technology, allowing you to connect to your Android or iOS powered device. Having four probes at your disposal is a nice ability, but you will need to buy two extra probes if you want to use the thermometer’s full capabilities since it only comes with two-meat probes out of the box. I highly suggest purchasing the optional ambient temperature probe to take advantage of its full temperature reading abilities. The iGrill2 comes with Minimum and maximum temperature alarms as well as preset and custom alarm settings. Sold by Weber, and including their great customer service, it comes with top-notch quality and attention to the details that matter the most to a griller. Although the iGrill2’s reputation and ratings took a big hit after Weber purchased the brand from iDevice, it was not because of the quality or precision had changed. It was more because Weber changed the awesome iDevice custom downloadable app and removed most of the fantastic features most users had come to love. Since taking that beating, Weber has been slowly but surely trying to update their new app with as many of the once loved features as possible. They are getting close. The iGrill2 has a wide temperature range from -58 to 572°F, making it a true all-purpose wireless thermometer. The wireless range is based on Bluetooth technology and is therefore limited to only 150 feet, but the 200-hour battery life while employing Bluetooth helps make up for the lower range, in my opinion. The iGrill’s Bluetooth connection and app make it super simple to use. If you can connect a speaker or headset to your phone, you can use this thermometer no problem. The Weber iGrill2 can be had for anywhere from $89 to $120 on Amazon. One downside to the iGrill2 is the necessity to buy extra probes if you want to take full advantage of its features. The iGrill2 only comes standard with two probes but can be upgraded for more. The need to buy extra products is just a bit unfortunate. 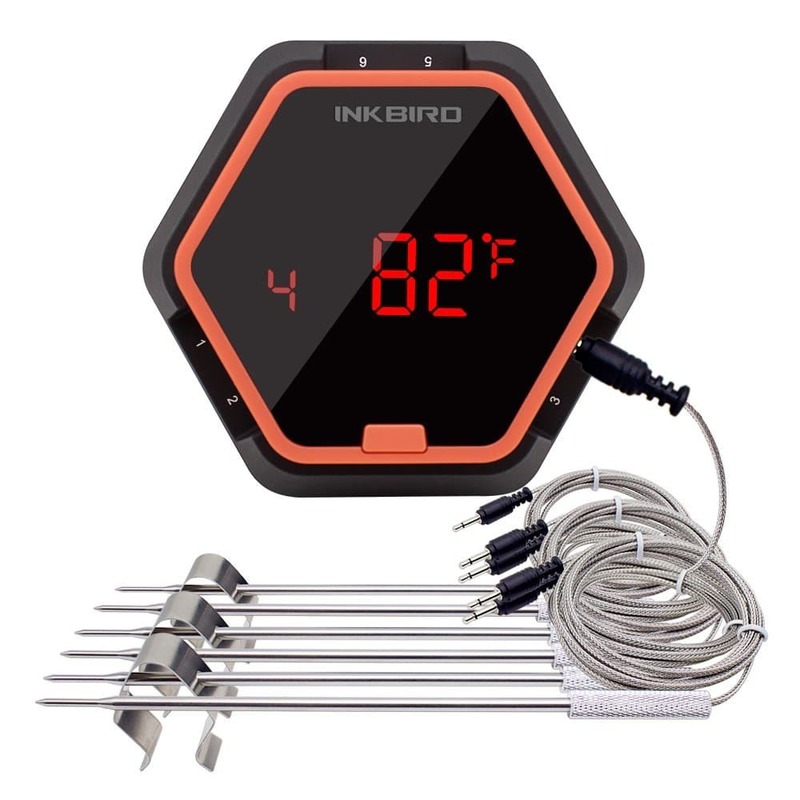 INKBIRD is working hard to become one of the top names in wireless thermometers, and the IBT-6X is one of the hottest sellers in their product line. One reason is that, as the name implies, it can hold up to 6 probe sensors, which allows you to monitor half a dozen proteins, sauces, loaves of bread, or candy mixtures at once. Anything that lets you multitask easily, efficiently, and safely is a boon in the kitchen or out at the grill. 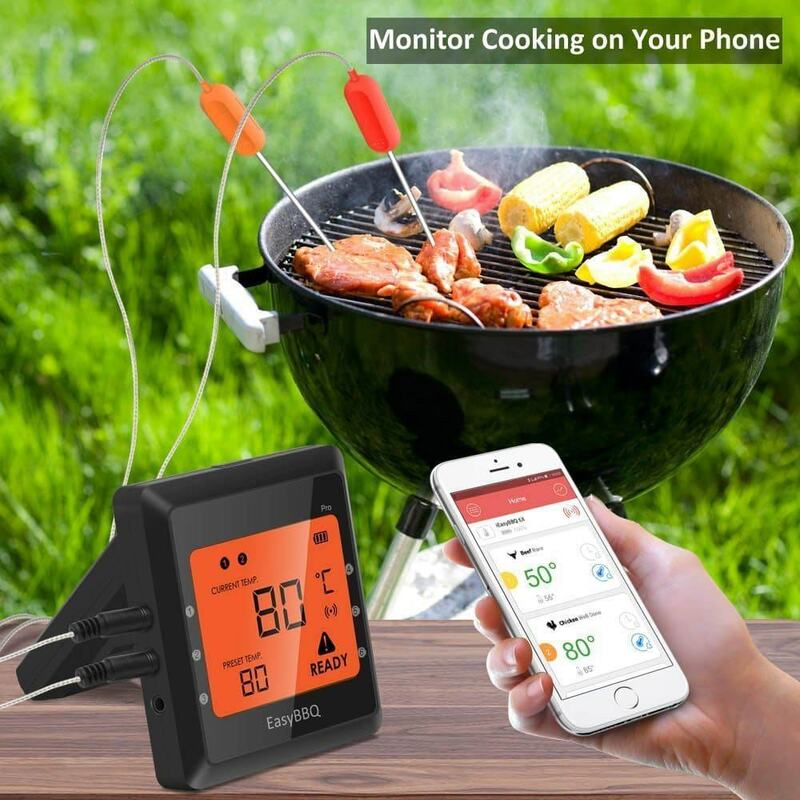 Since both the sensors and the cables that connect them to the main unit are able to withstand temperatures up to 570℉, you can grill, roast, or smoke pretty much anything. The thermometers temperature range is 32~ 572°F. You can download the app that runs the IBT-6x wireless Bluetooth thermometer for free. It keeps you updated about cook times and temperature readings. You don’t have to constantly check your food, which negatively affects the final product, anyway. Like other app-driven thermometers, there are presets for a variety of proteins and cooking techniques. You can leave them as they are or adjust them to your preferences. The alarm guarantees that you’ll know it the second your meat drops below or rises above the number you set. The INKBIRD IBT-6X costs $59.99 on Amazon for all six probes. There are also options for purchasing it with only two or four probes at a cheaper price. The App and device are both super easy to use and the Bluetooth range while limited is very reliable. The following wireless thermometers each scored well and all have their benefits but had at least one flaw that prevented them from being on the above list. That is not to say that they are not worthy products and not worth considering. Just know what these limitations are. This very well may be the best wireless thermometer on this entire list. If it wasn’t for the ultra-high price that comes along with it, it would have been near the top. I just didn’t think this product was set at a realistic price for the average backyard warrior, therefore it missed the cut. It comes in at $189 for the standard edition and at $249 for the Extreme BBQ addition. This cloud-connected thermometer lets you log in through a WiFi connection to adjust your settings or monitor your cook from anywhere you can get connected to the internet. You can get more info on the Fireboard FBX11 by clicking here. I really wanted to like this App controlled Bluetooth thermometer by Maverick as they have a great reputation and make quality thermometers. There are just too many reports of issues with the downloadable App used to control this thermometer that has kept it off this year’s list. I hope that Maverick can get it straightened out soon so I can give it another consideration. The ET-35 costs around $80 on Amazon. You can learn more about the Maverick ET-735 by clicking here. The TP07 is another quality thermometer made by ThermoPro. A few of the drawbacks include the ability to only handle one probe, not advised to be used for oven cooking because the accuracy is not guaranteed above 200º F, and not being waterproof. Perhaps the biggest drawback is its failure to communicate signal loss from the transmitter. That can be a deal killer for many. Besides that, the ThermoPro TP07 gets high marks for ruggedness, overall performance and of course, price. The TP-07 costs about $36 on Amazon. You can learn more about the ThermoPro TP07 by clicking here. 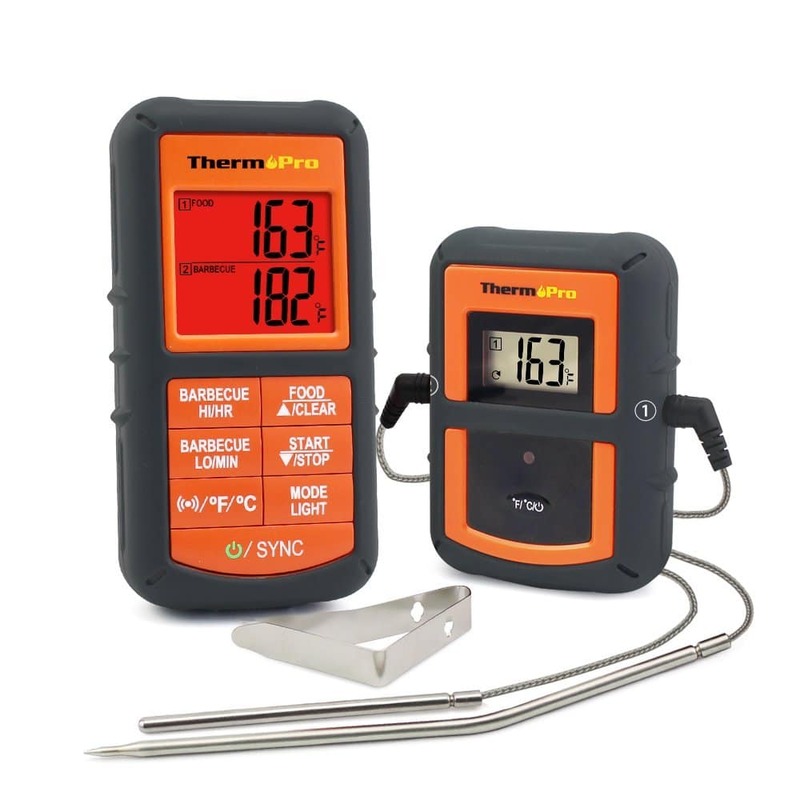 ThermoPro keeps churning out worthy thermometers and the TP-08 dual probe wireless is no exception. In typical ThermoPro fashion, this thermometer gets high marks for performance, ruggedness, and price. Were it falls short is in the design and implementation process. The biggest drawbacks are not being able to clearly tell which is probe 1 and which is probe 2 in the initial set up. The button usage also gets confusing as there are several setting functions that use the same button. You really need to keep the user’s manual handy and that is not very convenient. Lastly, and one of my biggest pet peeves, the temperature range can only be cycled one way so if you miss your preset mark, you have to scroll all the way through the temperature range again to hit your mark. It’s easy to imagine why this could be frustrating. If you can get over these minor annoyances, this is an accurate and sturdy thermometer. The TP-08 costs about $46 on Amazon. You can learn more about the ThermoPro TP-08 by clicking here. You can learn more about the G&C Ltd. GrillEye Bluetooth Thermometer here. The Ivation is a great budget wireless thermometer that had made my last list last year. It’s not that it did anything to get worse this year, it’s just that several other thermometers got better. It is still a worthy wireless thermometer and perfect if you are watching your bank account. There a lot of things to like about this low-cost wireless thermometer. The Ivation costs about $40 on Amazon. 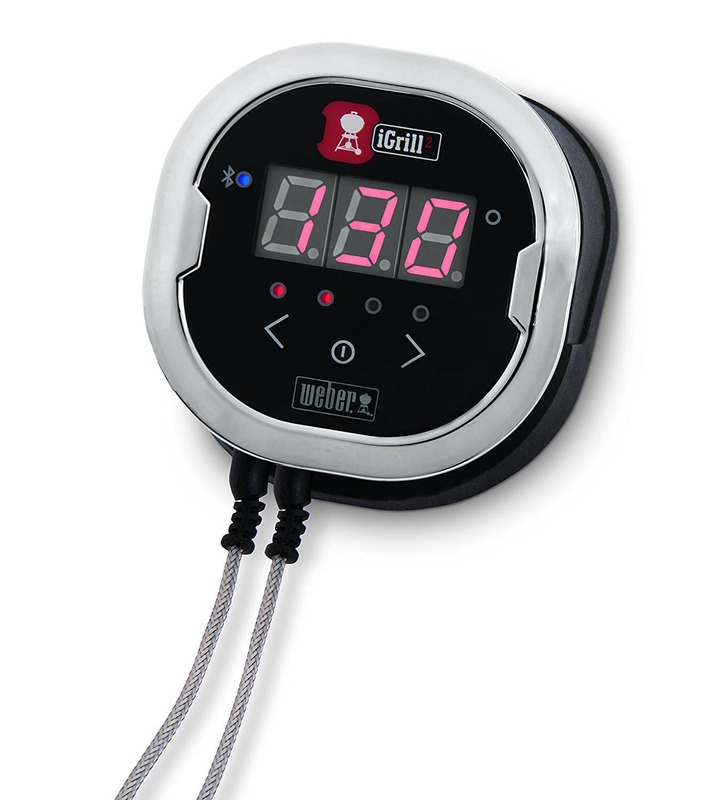 You can learn more about the Ivation Wireless BBQ Thermometer here. When looking for the best digital meat thermometers, the proof is in the performance. The reasons to have a digital thermometer for grilling, smoking, roasting and more include improving your final food product and making the cooking process a bit easier. The less you need to worry about your meat being under or over cooked the better. Whether that means being constantly updated, having specific temperature alarms set, or utilizing extra probes, having additional safety nets is what having a wireless thermometer is all about. There are some completely necessary aspects of a good wireless digital thermometer. There are also some aspects that might not be totally essential but are fantastic additions to the fundamental requirements. 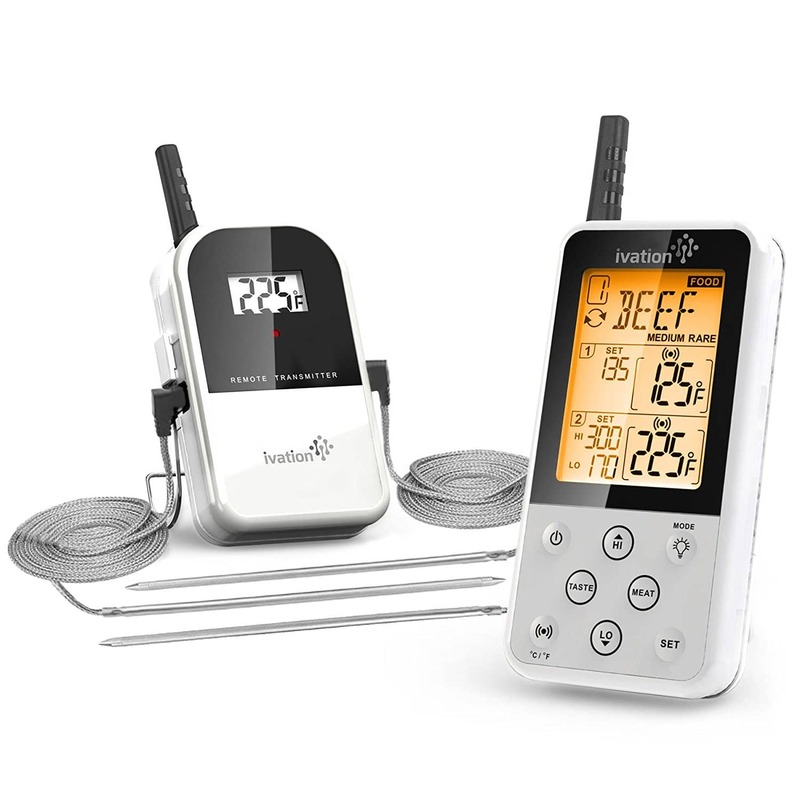 Here is a quick breakdown of what to look for in the best wireless digital meat thermometers. Cooking a great steak to perfection means knowing how hot it is through the whole culinary process. That means knowing the temperature from before you start cooking until you pull it off the grill (or out of the pan). 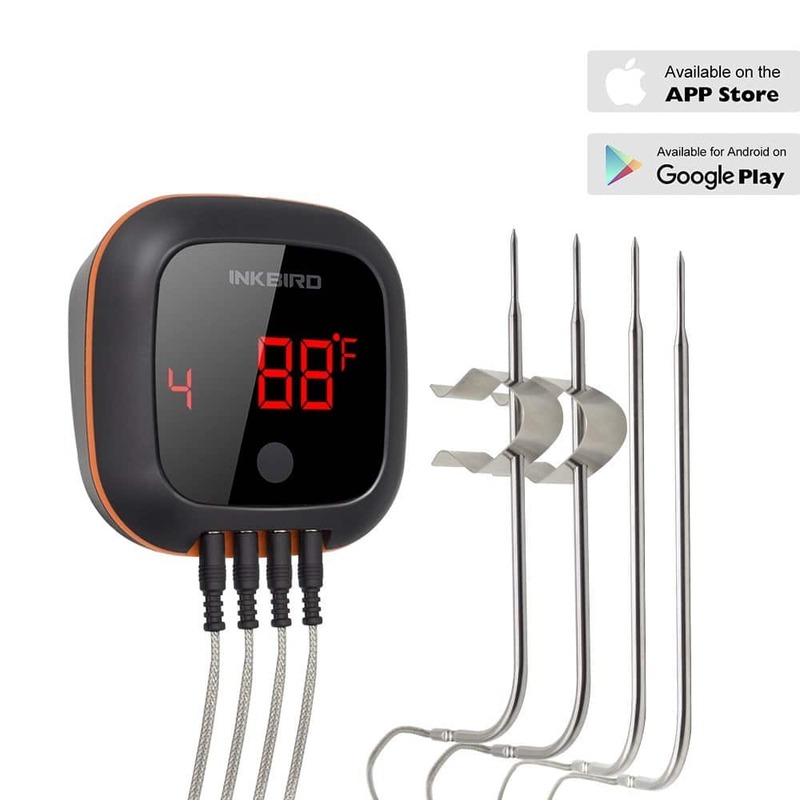 Due to that requirement, having a digital meat thermometer probe that can give you accurate readings across a larger range of temperatures just makes sense. While you may not expect to use your thermometer to test the heat of volcanic lava (that would be cool though right? ), the ability to test from below zero to well above 300 degrees Fahrenheit is a nice perk. You won’t need to test below zero while grilling, but investing in a digital thermometer usually means you are looking to use it for more than grilling alone. Finding the thermometers with the best range of temperatures is a great aspect when shopping around. As the saying goes, “you get what you pay for”. Looking at customer’s digital meat thermometer reviews though, you can see that this is not always the case. There is a fine line between paying more for better features and shoveling the dollars out in blind expectation to get the best product. When looking at the price of a meat thermometer, balance it out with the features of the product. Is the quality worth what the seller is asking for? The cheapest thermometer doesn’t always mean the best deal, but neither does the most expensive. 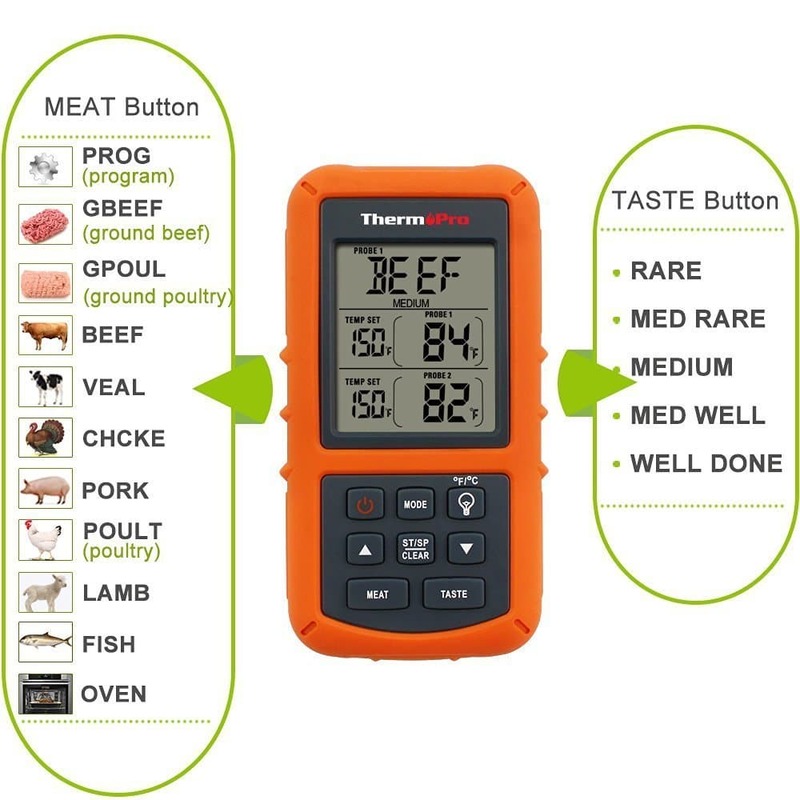 One the best options remote digital meat thermometers offer today is the ability to monitor your food for you without you having to hover over the grill. Don’t want to miss your favorite sports team playing on TV? Use a remote digital meat thermometer. Want to play a quick game of catch with your son or daughter? A remote digital meat thermometer has got you covered. Need to finish prep work or work on side dishes? Again, your best bet is a remote digital meat thermometer. Some of the thermometers we are reviewing today use Bluetooth technology; others have a receiver that is set up specifically for that thermometer. Several have apps that you can install and use to monitor your food right on your smart device. Either way, we should expect that all the best digital meat thermometers will have some type of wireless capability. The ability to step away from your grilling, smoking, or other cooking, means you can work on another dish while you wait. Of course, always be sure to keep an eye on your cooking. Nobody likes a house fire. Nobody wants a thermometer they don’t know how to use. If a thermometer is too difficult to set up or doesn’t work easily, the draw for that brand burns up faster than your unchecked roast. We want a digital thermometer that is self-explanatory or at least has a quick and efficient manual to walk us through the set-up process. Also, the ability to program the thermometer gives such a huge bonus that we have come to expect it. Any of the best meat thermometer probes should warn you if your food or grills heat exceeds or drops below your desired temperature. This is one of the biggest incentives to buying a digital meat thermometer, so it should be included. Extra perks and features are always welcome. Things like battery life, stability, warranties, and more all play a part in deciding which thermometer to buy. Even if they aren’t the most important aspects of a digital meat thermometer for grilling, the extras can make or break a purchase, especially with such stiff competition just a click away. Let me start off by saying, you don’t actually want to hit the dead center of the meat. The trick is to find the coolest part of the meat. Start by finding the thickest part of the meat. Then push the thermometer three-fourths of the way through. Now slowly pull back on the thermometer while paying attention to the readings. You will eventually hit the low-temperature point. This is where you want the probe to be. Fill a large drinking glass with water and enough crushed ice to be somewhat slushy. Stir well. Insert the thermometer probe stem two inches into the glass without touching the bottom or sides. After 30 seconds, the thermometer should read 32 degrees Fahrenheit. Using a deep pot, bring your water to a full boil. Insert the thermometer probe stem two inches into the boiling water without touching the bottom or sides. After 30 seconds, the thermometer should read 212 degrees Fahrenheit. For those models that can be calibrated, use either the ice water or boiling water method. Submerge the probe in the water (only the metal probe, not the whole thermometer or the probe wire). Hold down the calibrate (reset) button if there is one or hold the On-Off button for 6 to 10 seconds or until the display reads the correct hot or cold temp. Pro tip: If your thermometer does not come with a home calibration option, many manufacturers will offer to do it for you if you send it in to them. It doesn’t hurt to inquire with the manufacturer if your thermometer readings have become inaccurate. A little soap and warm water will normally do but you must be careful not to get the actual wires wet. Another method is using pre-made probe wipes. Probe wipes are specifically designed for food thermometers and are pre-soaked with cleaning solution to prevent harmful bacteria from growing. Last but not least, you can hold the stem of the thermometer in boiling water for at least thirty seconds. At 171 degrees, harmful bacteria will die. Pro tip: Another excellent option is using pre-made probe wipes that are sold online. Think baby wipes but for your thermometer. These wipes are specifically made for food probes and are soaked with a cleaning solution that helps kill harmful bacteria that causes food safety issues. The CDN PW-90 Thermometer Probe Wipes are a good example. The sheer number available makes it tough to choose the best wireless digital meat thermometers. The basic features seem to be found in every product. It comes down to a few points when really deciding. How much money do you want to spend? The products on this list range from $30 to over $100. If you are a serious griller, the $100 option might not phase you in the slightest. For those who have their bank account in mind while shopping for a thermometer, the budget thermometers I reviewed here are also good options. They may not have every extra feature, but they will get the job done in an accurate and efficient manner. What are you going to use your thermometer for? Having the ability to sense below 32 F comes at a cost. If you would like that ability, it is worth spending a bit extra now, then to reinvest later. But if you are sure you will only be using it for meat, there isn’t much point in paying extra for something you won’t use. What level of technological know-how do you have? Though everything on this list is achievable by the Average Joe/Jane, the thermometers with their own wireless receivers will take little to no setup for use. That can be a big bonus if you don’t want to mess around with Bluetooth, Apps, or wireless internet. Final Verdict – Which Digital Wireless Thermometer Is Best? Once again, the Thermoworks Smoke Wireless Thermometer is my choice for the best overall wireless digital grilling thermometer for 2018. If you can afford the higher price, this wireless thermometer will be worth every penny. A close second is the Maverick ET-732 wireless thermometer and it will only cost you a little more than half the cost. Digital meat thermometers are a great innovation in the grilling world, and they are sure to make your meats come out better. The perfectionists out there, or even the casual griller, should think about investing in a wireless thermometer. They give new capabilities in the grilling, smoking, and roasting realms. Hopefully, this list will help you choose which product is right for you! 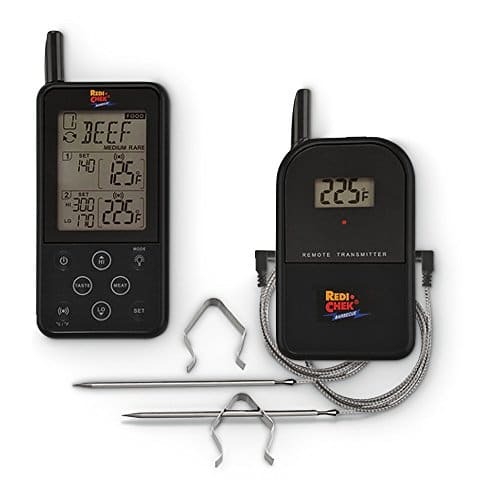 As always, if you or someone you know is interested in The Best Digital Meat Thermometers Reviews or you find this information useful, please consider sharing it with your Grilling friends and on social media! If you would like to leave a comment or have a review of your own to share on the best wireless digital thermometers, please do so below. We always welcome your input. Why Buy a Traeger Grill – Read This And Decide For Yourself How Does a Propane Smoker Work? – The Convenience May Surprise You Electric vs Charcoal Smokers: Which One Is Best? More Importantly, Which One Is Best For You?